What is Sciatica, and what are the causes? Sciatica refers to pain that radiates along the path of the sciatic nerve, which branches from your lower back through your legs down to the feet. 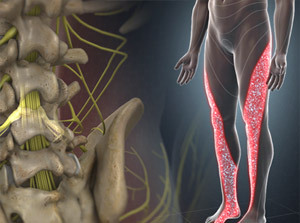 Up to 10% of the population suffers from sciatica, and patients are most likely between ages 25 and 45. Sciatica is often the result of a pinched nerve affecting one or more of the lower spinal nerves. The nerve might be pinched inside or outside of the spinal canal as it passes into the leg. This causes inflammation, pain, and often some numbness in the affected leg. A herniated disc or bone spur causes pressure on a nerve root. A small muscle in the buttocks becomes tight or spasms, causing piriformis syndrome, which can irritate the sciatic nerve. Spinal stenosis , or the narrowing of the spaces in your spinal column, creates pressure on the nerves. In rare cases, the nerve can become compressed by a tumor or damaged by a disease such as diabetes. Generally, sciatica affects only one side of your body. It may feel like a bad leg cramp with sharp pain that lasts for weeks and symptoms growing worse after long periods of sitting. It’s especially likely to follow a path from your lower back to your buttock and the back of your thigh and calf. To diagnose sciatica, your doctor may check your muscle strength and reflexes. While imaging tests may reveal a herniated disc or bone spur, you may not feel the symptoms, so doctors only order imaging tests in painful cases. What are some home remedy solutions to sciatica? Most people can treat sciatica at home with over-the-counter pain relievers and hot or cold packs. Resting for a day will provide some relief, but too much inactivity will cause discomfort in other parts of your body. Controlled stretching exercises can help reduce inflammation and resume normal physical activity without pain. Although the pain associated with sciatica can be severe, most cases resolve with non-operative treatments in a few weeks. We tailor all of our treatments for sciatica to the specific patient with pain management programs that may include muscle relaxers and pain medicines followed by physical therapy. In some cases, we might employ interventional techniques such as epidural steroid injections. The corticosteroid can deposit powerful anti-inflammatory medication near the pressure points around irritated and swollen nerve roots. We can even target specific nerves, which helps you improve your function more quickly. Because repeated steroid injections can weaken bones and connective tissue, it’s important to have the procedure performed at a pain treatment center by a Fellowship Trained Interventional Pain Doctor. We are part of a select class who has pursued additional training to provide you with state of the art care. Steroid injections do not work for everyone, so you should maintain an open dialogue with the pain control clinic about the progress of your treatment. If your symptoms become more severe, you develop a fever of over 101, or you notice redness or drainage at the injection site, you should call your pain doctor or go to the nearest ER.